Microsoft has now release the new ADMX pack for Windows 10 1511 (Threshold 2). What is notable about this release is that is has the Group Policy setting “Defer Upgrade and Updates” which is the policy that enabled the Windows Update for Business feature. This policy setting can be found under the “Computer Configuration\Policies\Administrative Templates\Windows Components\Windows Update”. To enable the new policy setting install download the Windows10_Version_1511_ADMX.msi from http://www.microsoft.com/en-us/download/details.aspx?id=48257 and then copy the PolicyDefnitions folder over top of your Group Policy central store. 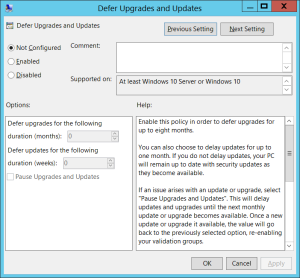 To use the setting simply configured the “Defer upgrade for the following duration” to the number of months you wish to defer the upgrade to the latest OS build. 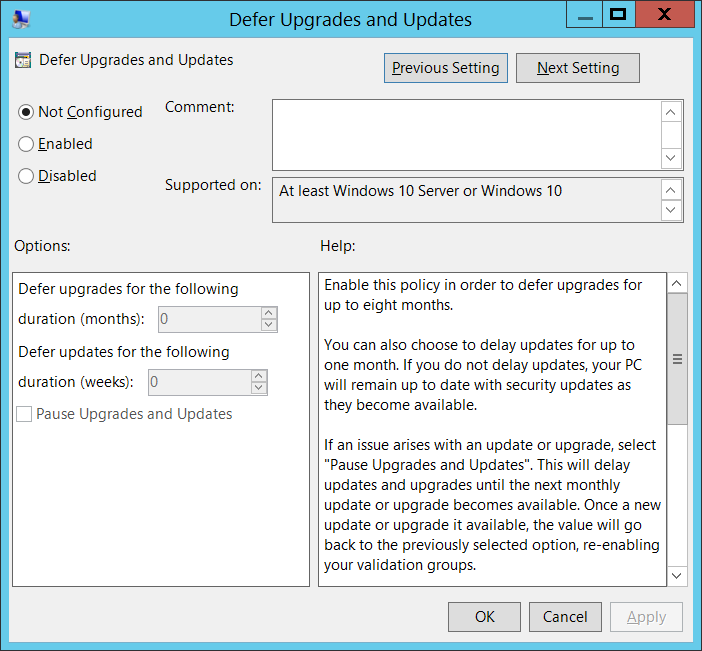 The “Defer updated for the following duration” is another option to delay the installation of security patches. Unlike the “Defer Upgrades” option “Defer updated” can only be deferred weeks based on their critical nature. Also note, these policy setting are only applicable to computers that are configured to use Windows Updated as a source for patches. Updates that are delivered in corporates using WSUS are still controlled via the more traditional approve/deny within the tools itself. After the upgrade and replacement files in “PolicyDefinitions”. Getting the error “Name space ‘Microsoft.Policies.WindowsStore'” is already defined as the target namespace for another file in the store”. See file winstoreui.admx line 4, column 80.
who knows how to fix? Deleting the WinStoreUI.admx & WinStoreUI.adml from my PolicyDefinitions folder fixed it for me. Those files appear to conflict with the new WindowsStore.admx & WindowsStore.adml files. The new files appear to have all the same settings plus a few more. The settings appear in “Administrative Templates > Windows Components > Store” for both User and Computer Configuration. removing winstoreui.admx/adml files solved problem, these files are from 8/8u1. I’m Getting the very same errors. Is there a new reference spreadsheet that shows the new policies in 1511?